The VoiceThread iPad app is a great tool for students to create quick and simple multimedia slideshows and add comments. When it comes to your more administrative functions such as managing student accounts and sharing their VoiceThreads, it’s best to use a laptop or desktop computer to sign into the VoiceThread website. Currently, you can add and manage student accounts and groups only through the website. That function is not available in the iPad app. Similarly, you’ll also have a greater range of sharing options using the VoiceThread website. All the VoiceThreads created by students in your class group will be listed under the My Voice tab. You can keep any VoiceThread completely private, share it with any group such as your class, or make it completely public. When sharing, you can also specify whether the user can only view or is also permitted to leave comments. Currently, the iPad app is limited to sharing via e-mail in the current version. Many students may be using an iPad at school but not at home. VoiceThread is web-based, which means it works on any web browser as well as the app on your iPad. 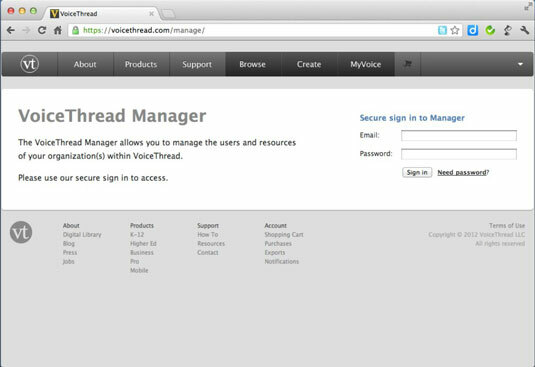 If you don’t have your iPad, simply go to the VoiceThread website on any laptop or desktop to access your VoiceThread account. All the projects you started on your iPad will be available in the My Voice tab, where you can continue to edit and share them.